Beyoncé sings “I sneezed on the beat and the beat got sicker” on her 2015 single, “Yoncé /Partition.” Apparently, the crowd cheers as well. 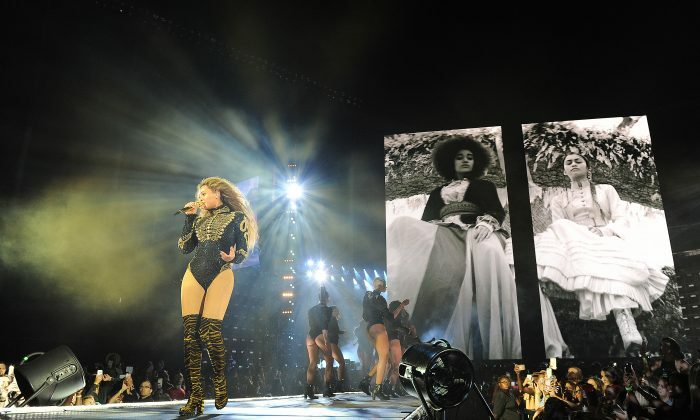 Beyoncé is currently on her Formation World Tour and made a stop at New York’s CitiField on Tuesday, June 7. Just before she began to belt the lyrics to the up-tempo track, “Love On Top,” the 34-year-old singer had to take a moment to blast out an irritant that infiltrated her nose. The crowd yelled, “Bless you!” and erupted in loud cheers. The show continued on without a hitch—including a tribute to Prince—but it was the sneeze that was heard around the Twitter world that had many talking. I saw @Beyonce sneeze on stage during the #FormationWorldTour and it changed my life. Like Beyoncé could sneeze and my wig would be snatched. See guys, Beyoncé IS human. She CAN sneeze. She just does it flawlessly while wearing Gucci and slaying our existence is all. One previous concertgoer wished the songstress had sneezed during her show. I’m lowkey mad Beyonce didn’t sneeze at the Toronto show too. Yes, I know how ridiculous I am. Other Twitter users didn’t deem the star’s sneeze as newsworthy. The “Formation” tour continues on Wednesday night at CitiField.